I believe the comparison was simple: dual-Krait compared to 4xA9. I claimed Krait would be much closer to A15 level than A9 -- I was right. I claimed that 2xA15 (and 2xKrait) will be far better than 4xA9. I hold to that but some may disagree. I can understand that point. I claimed that both Krait and A15 were set to target similar frequencies (~2.5GHz) according to release -- I was right. 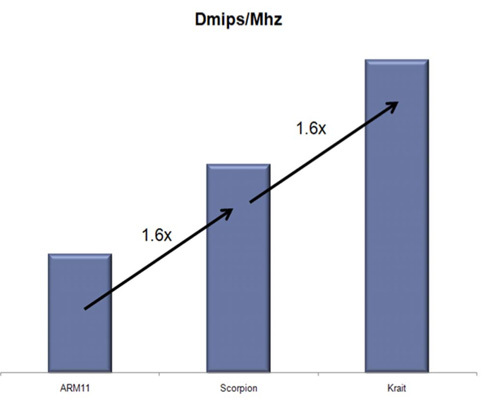 I claimed that Krait will initially be ~1.4-1.7GHz on 28LP and is planned to reach 2.5GHz on HKM -- I was right. On every point, you disagreed with me -- and stated "I know for a fact that such and such". Did Krait turn out to be "a modified A9" as you claimed? No. Is its projected performance and clockspeeds far closer to A15-class than A9? Yes. Also, how often do you think that quad-core on your desktop actually gets utilized? Are you under the impression that multithreading is some kind of magical pixie dust that you sprinkle on to an OS kernel and all of a sudden, your applications will run faster? -- This should be common knowledge by now: only certain workloads are highly parallelizable. On top of that -- as we've discussed previously -- there is a very small subset of computationally intensive, highly thread-scalable applications out there. Specifically: compression, video transcoding and image processing (which will likely be the biggest performance-demanding app for the CPU on tablets what with the Photoshop Touch series). So yes, on 4xA9, that could potentially scale to all 4 cores. But here's the thing: those are all very NEON/FPU intensive applications. And guess what subsystem was substantially improved in A15 compared to A9? Double the data path width, unified load-store, fully out-of-order VFP + NEON and lower integer execution latency on top of that (which, IIRC, is what most image processing algorithms use). In the Power vs. Temperature plot on page two, have the axis labels been reversed accidentally? It seems pretty clear. As temperature increases (right on the X axis), 40G transistors consume more power (up in the Y axis). The power increase vs temperature increase curve of 28LP doesn't grow as fast. Metafor is right about the curve having to do with the process. His explanation kinda makes it seem like a temp increase causes the power increase though. It's the power increase that causes the temp increase, and "G" transistors are designed to handle more power without wasted heat(temperature increase) compared to "LP" transistors. There's also a second reason why 28nm is hotter than 40nm. If you have a certain amount of heat energy being produced at a certain power level, the 40nm transistors will be a certain temperature. Now take that same amount of heat energy being produced, and shrink the transistors to half their size. This increases their temperature within the same power envelope. This is a problem in a lot of circuit design. Power dissipation (both due to scattering and increase in resistance of the charge channel) increases with temperature. But temperature also increases as more power is dissipated. It's a positive feedback loop that just gets hotter and hotter. When simulating a circuit, this problem has to be taken into account but simulating the heat dissipation is difficult so one can never be sure that a circuit wouldn't overheat under its own operation. Basically, it's increasing the power of the chip, which increases heat energy output, that increases the temperature. And with that increase in temperature, comes an increase in power. Heat dissipation is the only way for the chip to keep itself from burning up. It's just impossible to really tell how much can be dissipated under even certain conditions due to heat exchange kinetically between atoms, and most likely the radiation amount differs between atoms. The minute a company gives you a bit of attention,you forget about objectivity. 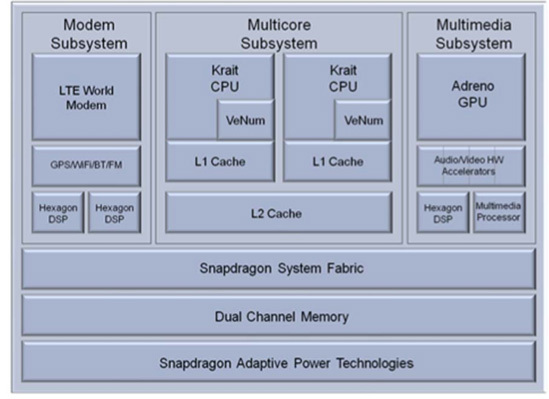 "The key is this: other than TI's OMAP 5 in the second half of 2012 and Qualcomm's Krait, no one else has announced plans to release a new microarchitecture in the near term"
"Qualcomm remains the only active player in the smartphone/tablet space that uses its architecture license to put out custom designs."